The Fair Work Commission has handed down its decision on Domestic and Family Violence Leave. When do the new provisions kick in? Anyone covered by a modern award including casuals. Award free employees, employees covered by an enterprise or other registered agreement and state reference public sector awards. What is a summary of what’s included? Employees are entitled to 5 days unpaid family and domestic violence leave each year of employment. Employees are entitled to the full 5 days from their first day of employment – they don’t need to accrue the time. Unused time does not roll over each year, but the 5 days entitlement renews each year. Taking the leave doesn’t break an employee’s period of service but it does not count as service when you calculate other paid entitlements such as annual leave. The leave doesn’t have to be taken all at once and can be taken in single or multiple days, or less than a single day on an agreement with the employee. The employee may also take other leave including annual leave, or sick or carer’s leave (depending on the circumstances). You are required to take reasonable steps to keep information about the employee’s situation confidential. If a current award or employment contract provides for less than the minimum entitlement in this decision, the award entitlement overrules the existing award or contract, and the employee will be entitled to the full five days. What are the terms of the clause that will be inserted into the awards? X.1 This clause applies to all employees, including casuals. family and domestic violence means violent, threatening or other abusive behaviour by a family member of an employee that seeks to coerce or control the employee and that causes them harm or to be fearful. (b) A reference to a spouse or de facto partner in the definition of family member in clause X.2(a) includes a former spouse or de facto partner. Note: 1. A period of leave to deal with family and domestic violence may be less than a day by agreement between the employee and the employer. The employer and employee may agree that the employee may take more than 5 days’ unpaid leave to deal with family and domestic violence. Note: The reasons for which an employee may take leave include making arrangements for their safety or the safety of a family member (including relocation), attending urgent court hearings, or accessing police services. (ii) must advise the employer of the period, or expected period, of the leave. An employee who has given their employer notice of the taking of leave under clause X must, if required by the employer, give the employer evidence that would satisfy a reasonable person that the leave is taken for the purpose specified in clause X.4. Note: Depending on the circumstances such evidence may include a document issued by the police service, a court or a family violence support service, or a statutory declaration. (a) Employers must take steps to ensure information concerning any notice an employee has given, or evidence an employee has provided under clause X.6 is treated confidentially, as far as it is reasonably practicable to do so. (b) Nothing in clause X prevents an employer from disclosing information provided by an employee if the disclosure is required by an Australian law or is necessary to protect the life, health or safety of the employee or another person. Note: Information concerning an employee’s experience of family and domestic violence is sensitive and if mishandled can have adverse consequences for the employee. Employers should consult with such employees regarding the handling of this information. An employee is not entitled to take leave under clause X unless the employee complies with clause X. 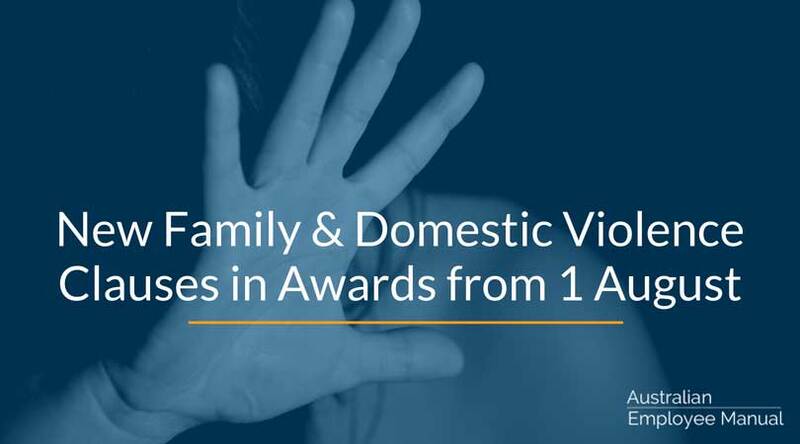 Make yourself aware of the new Domestic & Family Violence provisions. Download a copy of the revised awards that apply to your team. Brief your payroll officer so they can reflect the new provisions in the payroll system. Brief your team to let them know of their new entitlements. 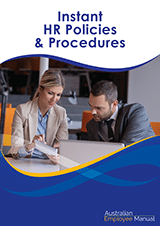 Update your HR Policies and Procedures Manual. We have updated the leave provisions of our Domestic and Family Violence Policy in our Instant HR Policies and Procedures Manual to reflect the new clauses. Existing owners of the HR Manuals with a current subscription will be able to log in and download the latest version.